Between Light and Letter is a laser lit hologram generated from a 3-D model using a pulse laser. It is the second algorithm in the Holographic Poetics Series. 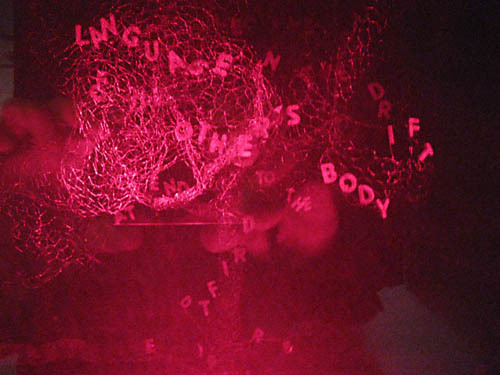 In 3 words, the first in the Series, different angles of the scene and unseen shift in parallax as the “reader” moves her body to view a cascade of letters playfully interrupting and insinuating significant phonetic nodes. Between Light and Letter invites readers to consider nuances—shadows in formation—in the body and language as both e/merge at the intersection of memory and desire. It evokes “the unthought known” [Christopher Bollas], the unsayable in the rustle of language, where art meets science, on the other side of sound. Special thanks to the Photon League for their continued support.